From the author of the New York Times bestselling and Edgar Award-winning The Expats comes an elegant and riveting espionage thriller about spies, secrets, and the devastating power of the truth. In New York, in the early dawn hours, literary agent Isabel Reed is reading frantically, turning the pages breathlessly. The manuscript—printed out, hand-delivered and totally anonymous—is full of shocking revelations that could bring down one of the most powerful men in the world, and initiate a tremendous scandal implicating multiple American presidents and CIA directors. This is what Isabel has been waiting for: a book that will help her move on from a painful past, a book that could reinvigorate her career . . . a book that will change the world. In Copenhagen, CIA agent Hayden Gray has been steadfastly monitoring the dangers that abound in Europe. His latest task is to track a manuscript—the same manuscript that Isabel is reading. As he ensures that The Accident remains unpublished, he’s drawn into an elite circle where politics, media, and business collide. On the one hand, the powerful mogul who has unlimited resources to get what he wants. On the other, a group of book professionals—an eager assistant, a flailing editor, an ambitious rights director, and a desperate publisher—who all see their separate salvations in this project. And in between, the author himself, hiding behind shadowy anonymity in what he hopes is safe, quiet Zurich. In this tangled web, no one knows who holds all the cards, and the stakes couldn’t be higher: an empire could crumble, careers could be launched or ruined, secrets could be unearthed, and innocent people could—and do—die. Buy a copy, and immerse yourself in this story. 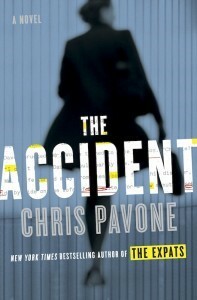 CHRIS PAVONE is the author of the New York Times-bestselling The Expats, winner of the Edgar Award. He was a book editor for nearly two decades and lives in New York City with his family. “Los Angeles has the film business, and Paris has fashion; Berlin is for espionage.” I was hooked on The Accident from the very first page, but it’s that sentence that really sold the book for me. It’s an unspoken observation by one of the lead characters, CIA agent Hayden Gray, and it’s the perfect example of snappy language found throughout this book. 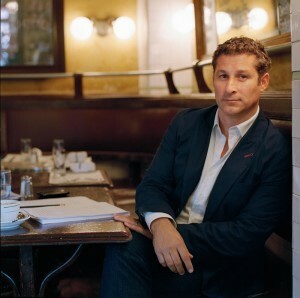 A book about a manuscript is more than a little meta, but author Chris Pavone pulls it off with aplomb. His bio says he used to work as an editor, so it makes sense that the characters in the publishing world rang true, but the parts of the book that dealt with espionage felt as true to life as anything LeCarre or Clancy ever produced, with a good deal more depth than others. Dialogue never seemed stilted, technology never seemed misused, and the story was gripping from the first page to the last…and as I tweeted earlier today: READ THIS BOOK. You won’t regret it. Goes well with a perfect cappuccino and a plate of half-moon shaped lemon cookies. This review is part of a blog tour. For more information, and the complete tour scheduled, click here.